Adel is a community where every member is connected through personal and funding participation. 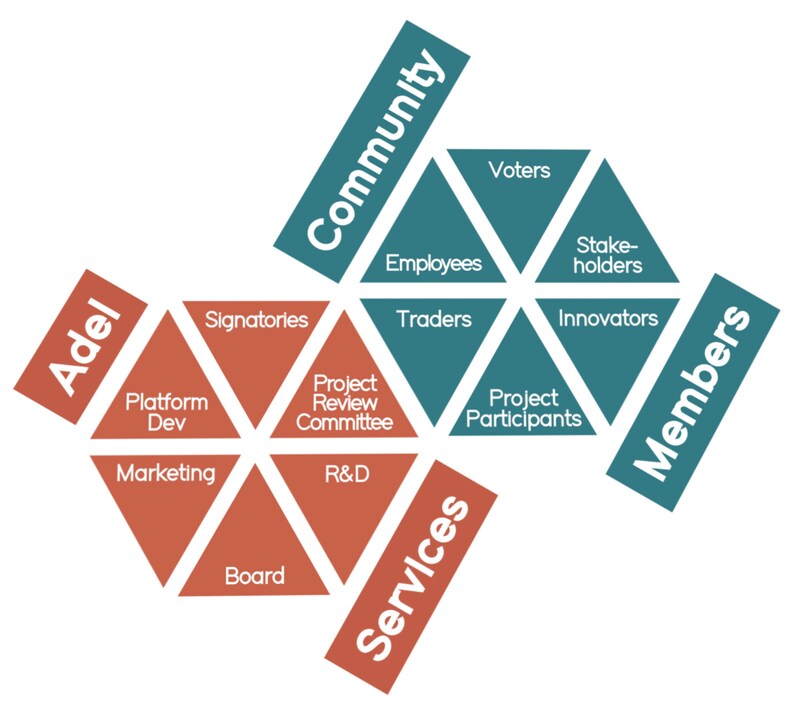 This paper outlines the roles and responsibilities of the community’s participants, including stakeholders, project managers and Adel’s leadership team. Leadership ▲ The Adel Board will serve as a business advisory body for individual use cases throughout the entire project life cycle. Expert consultations from community members will always be welcomed. Decision ▲ Authority to enact final decisions on strategic activities and major fund allocation will reside within the community via the Voting Module. Decisions taken by the project team will be discussed, if needed, with Adel’s Board or community members possessing relevant expertise. Dialogue ▲ To support open debate within the Adel community, a Collaboration Module will be available to Adelphoi holders. This module will have minimal limitations and will provide guidance towards addressing important topics regarding operational and strategic areas that affect the entire community, as well as any individual concerns that may arise. Thus, a direct public and private communication line to Adel’s Board will always be available to all community members. Conduct ▲ All community members will be required to sign the Community Code as part of their registration process. Administrative monitoring of the Collaboration Module will oversee members who violate the Community Code and perform other abuses. Persistent violators will be added to the Community Blacklist. Participation ▲ Any and all community members are welcome to participate in individual projects and advisory activities. Every project will offer an open communication channel for suggestions via the community’s Collaboration Module. Regulation ▲ Guidelines will be provided to the community to promote efficiency in creating relevant project documentation, all of which will be available to community members on the community portal. A stakeholder is anyone holding any amount of Adelphoi. A stakeholder who holds a minimum number of Adelphoi will be invited to register and become an Adel community member. This ecosystem is fueled by the voting results of community members whose vote is weighted against the number of Adelphoi they hold. All participants in the community will have to identify themselves to meet minimum Anti-Money Laundering (AML), Counter-Terrorism Financing (CTF) and Know your Customer (KYC) requirements. Share their expertise and opinions in community projects. Use Adelphoi to make transactions within the ecosystem. Participate in voting and on forums via the Collaboration module. Fund projects as a majority community participant or as a group participant in minority voting results. Follow the progress of projects and help improve on ideas. Submit proposals as Innovator Projects. In this case, the community member is designated as the innovator and will receive a larger portion of the project’s rewards. Apply for open positions within Adel’s R&D team, the Project Review Committee, and other teams and groups covering areas such as project management, legal compliance and accounting. The board consists of top professionals, entrepreneurs, strategists and out-of-the-box thinkers. The board serves as the supervisory body for the protection of the entire community, ensuring no dangerous, illegal, immoral or unethical conduct occurs that could negatively affect or damage Adel’s brand. The board also serves as an advisor to projects throughout their operation and supports the transparency of all transactions and processes. 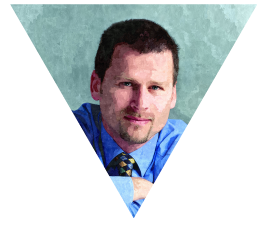 Research & Development ▲ Michal Vavrek ▲ The R&D team will create, develop and enhance project ideas that will be submitted to the community for approval. The R&D team will also be responsible for submitting relevant documentation for project approval. 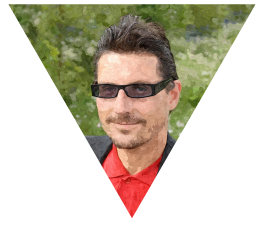 Marketing & Strategy ▲ Gabriel Dusil▲ This team will create and execute Adel ecosystem strategies for the community, as well as for individual projects. Activities will include both internal and external marketing strategies, communications, documentation, events, public relations, website design and copyediting. Legal & Operations ▲ Jan Lamser ▲ This team will ensure compliance with legal and regulatory requirements at national, regional and global levels for all community projects. The team will also be available to the community for individual projects within their respective jurisdictions. The Project Review Committee (PRC) will guide and help the Adel R&D team and innovators to properly document projects for submission and approval. The team will consist of professional consultants to evaluate ideas and polish their business plans. Consulting from the PRC will reside within the framework of reviewing plans, numbers, projections, strategies and marketing. It will also help steer the project with the best strategy. The Collaboration module will likewise be utilized by all community members who wish to provide guidance. Furthermore, consulting from Adel’s Board will focus on high-level strategy. The PRC will have an ongoing relationship with project teams in order to monitor, measure and evaluate key performance indicators (KPIs), cash flow, operations and overall strategy. The PRC will not be involved in daily activities. Their role will be to provide guidance and monitor the project’s progress on an ongoing basis. They will not participate as a staff member of any project. It would be up to the project owners (e.g. the project’s general manager) to hire staff for specific duties. Project Managers are responsible for monitoring community projects by ensuring the highest level of efficiency in resource usage. They are tasked with the responsibility of guaranteeing results and that objectives continue moving towards completion. They are also responsible for reporting the status of projects, as well as other operational activities such as accounting, though this can be delegated by the Project Manager if deemed necessary. Project Managers will be selected based on their area of expertise. Community members will be offered “first right of refusal” to participate in that capacity. Approval of the Project Manager, budget, timeline, milestones, business activities and developments will be confirmed by the Adel Board in order to protect the community. Funds will be released according to the developmental stages of the project and approval by the Board. If projects need additional funding outside of the approved budget (as agreed upon by the voting process) then the community will be consulted and its approval will be sought. Adel’s leaders have a special mandate to lead with integrity and will take all steps necessary to ensure the entire team does the same. This requires a visible commitment to promoting conduct that is positive towards the development of the ecosystem and compliant with all legal requirements. Our actions will demonstrate our belief that profits never overshadow our principles. Adel Services ▲ The staff will set up the proper framework starting from the top, and will act in the best interest of Adel and its stakeholders. We will work towards an ecosystem that will not support criminals, terrorists, or parties wishing to defraud or take advantage of our members through community involvement or projects undertaken by Adel. Adel Community ▲ All community members are connected with our values. Since the entire community can participate in each project, it is in the interest of Adel to ensure that projects meet legal and Community Code guidelines in order to protect our members. Legal & Regulatory ▲ Adel will comply with legal requirements relating to cryptocurrency exchange, governance, trading and taxes. We will ensure regulatory compliance and the satisfaction of legal requirements in all markets where we operate. Therefore, any projects that do not meet these requirements will not be approved by the Project Review Committee. This ensures the integrity of the Adel ecosystem while also protecting the integrity of each member in the community.